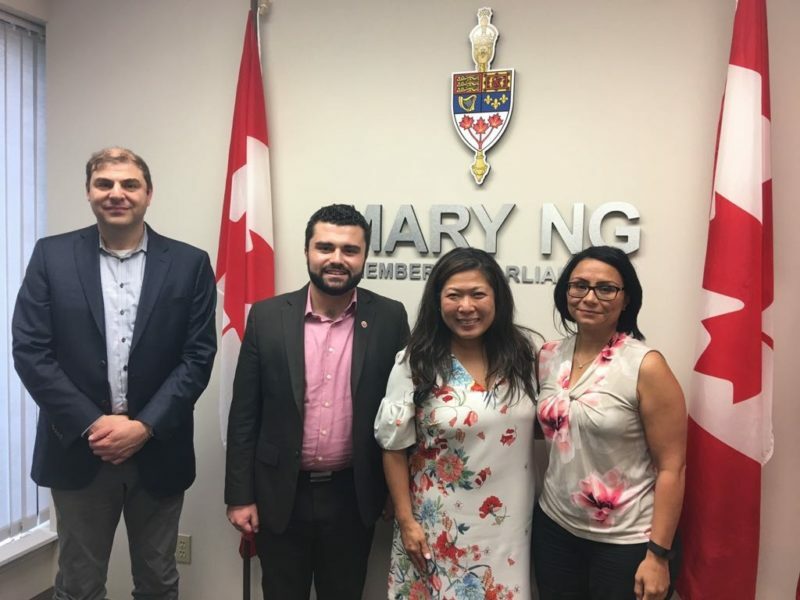 TORONTO – On Friday, Augsut 17, 2018, a delegation representing the Armenian National Committee of Canada met with Canada’s Minister of Small Business and Export Promotion, the Honourable Mary Ng. The delegation included ANCC chair, Mr. Shahen Mirakian, ANCC Executive Director, Mr. Sevag Belian and ANCC National Board member, Ms. Marianne Davitjan. During the hour-long meeting, ANCC delegates briefed the minister on the work of the Canada-wide ANC network and the history of the Armenian-Canadian community. Ideas were exchanged and productive discussions took place related to the latest developments in the governments policy on small businesses and export development strategy, ANCC’s upcoming nationwide initiatives, the bilateral relations between Canada and Armenia and current affairs in Artsakh. The upcoming summit of the Organization of La Francophonie and other ANCC policy priorities were also discussed.